Suppose you work on a project where you are spending a lot of time focused on the code and fixing the bugs that keep popping up. It’s been a stressful day and you know it, the worst of it is when you forget to commit your changes you have been working on the whole day. Then keep on reading..
Now I’m proposing having an automated script which will run git status on your repo every night and checking if things need to be committed or not. For clearer way to create this automator, here’s a good video tutorial to create calendar automators for that. Now this automator is basically calling a gitcommit shell script which you on your machine. echo "already up to date"
echo "a commit needs to be done." Now, this bash script goes and read from a cfg (configuration file) you have. In this case, I have my configuration file under osx_actions directory. var2 takes the default commit message you have, off course if commits happened automatically without you changing this message you may need to do git commit –amend to edit that message for that commit be more meaningful. Add an event to your calendar, choose whether you want it to repeat and how frequent and also add the time on which you want to this script to run. So, I think this is one of the coolest tools for one to us in creating / editing your styles right on the style. These global colors weren’t picked up, which made me scratch my head a couple of times till I found that that syntax is not accepted. Having a space before the color breaks it. This has been occurring lately, and I couldn’t find much written about it, took me a couple of days googling it and trying to find what would be the reason that Safari would ignore our width property. After discovering that the width property is completely messed up on Safari browser only on Mac computers as Safari on Windows didn’t have the same. I found that the solution for that is just to add a max-width property along with the width property. This has fixed it for the most part. No much reasoning I found after that, but seemed to me that width property has be associated with a max-width property as well in order to have the layout looking right. If anyone has different suggestions or a reasoning behind this, surely share. So after discussing two of the major pitfalls for UX designers these days, one has to discuss what seems to be a controversial topic among many of the UX designers these days; whether to use Flash in sites or not? Second major issue you’ll face with building sites in Flash it does not work well for accessibility, since it is based on images and that has the hindrance of having alternative texts, again the issue with screen readers. Third major issue would be its compatibility with touch screens, something you would not want to ignore or forget when building sites today. People browser through their iPads and Galaxies everyday and this number is increasing significantly as I mentioned before in my first blog of this series. I am sure many of us have seen these messages before. Yes, plugins do have their issues and they are not very stable. In using Flash into your site, you are setting yourself up to whatever issues the user may have with their browsers. And the most common of the issues on browsers are the Flash crashing issues. Then here comes the question, when should one use Flash then? So before saying the when? I have to say the when not? As mentioned in the title of this blog, it should be used by you shouldn’t rely on it in conveying your message. especially if this message is warning, like weather site warning of thunderstorms, or utility site warning of power shortage, these messages should be in developed using Flash. 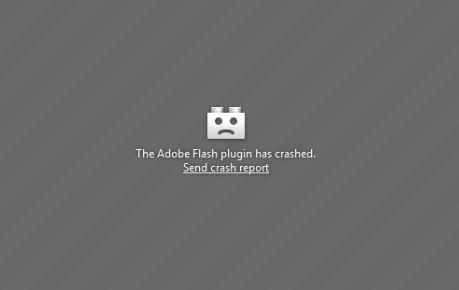 Another instance where you do not want to use flash is relying on it on user’s enrollment and payment, since this could pose issues as well like plugin crashed while user is enrolling or paying. You do not want your users to face such issues. Flash can be of very good use if you are presenting some that best be presented graphically, such as car model sites, fashion sites, artists/musicians or cartoon sites. These are just few examples. It can also be used within your normal site to present a certain ad which you think would best be presented in flash. Many of the major sites are practicing this and it still provides good experience for the use. Such as bbc.co.uk, USAToday and many others.. Flash can be used in many instances, but bear in mind, it should only be used when the site’s performance isn’t badly affected and goes along only when it is needed. For this reason, UX experts should study well how sites are made and optimized technically before coming up with too fancy ideas which would affect badly the user’s experience due to the mal performance of the fancy site.